Enables concurrent basic engineering, produces basic engineering deliverables, and supports lifecycle process engineering. Aspen Basic Engineering is a scalable, global process engineering platform, tying together all elements of front-end design.With a focus on the basic engineering function, Aspen Basic Engineering provides tight integration with the latest releases of all major process simulation, cost estimation, and equipment design programs―whether they’re commercially available or developed in-house. Need to perform concurrent basic engineering across several disciplines and by teams located in different geographies or at different subcontractor firms, working on one accurate design database. Requirement to manage process information consistently―throughout the engineering and asset lifecycles―improving design quality, as-built accuracy, and ability to recycle operating information for future designs. Imperative to deliver accurate cost estimation earlier into the concept design and basic design stages. Need to impose standard practices and methods enterprise-wide to ensure design quality, reduce maintenance costs, and ensure safety compliance. Capture best practices and design knowledge to improve the ability of less experienced engineers in delivering high-quality designs. Aspen Basic Engineering is an industry-leading process engineering solution that enables global organizations to seamlessly and accurately tie together all aspects of front-end design and basic engineering. Powerful and comprehensive, it integrates all major process simulation programs, equipment design programs, cost estimation and in-house design tools. Flexible out-of-the-box Datasheet and PFD and P&ID creation tools . help streamline engineering workflows, enabling faster, more efficient collaboration across the organization. In addition to providing an accurate and constantly updated information source for process design, Aspen Basic Engineering offers a robust set of out-of-the-box design deliverables, such as multi-disciplinary datasheets, PFDs, P&IDs, and equipment lists. 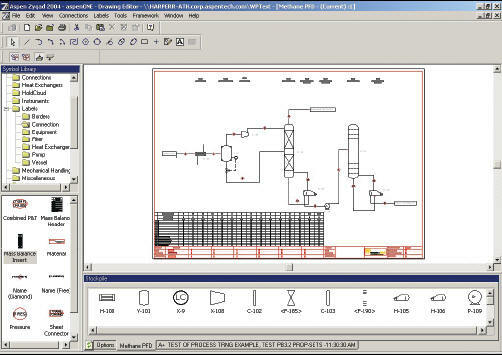 To support downstream engineering workflows, Aspen Basic Engineering enables the expansion of simulations to process flow diagrams and process flow diagram to P&IDs, maintaining design information and consistent connectivity. 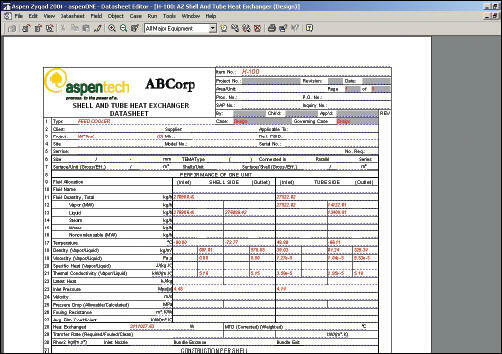 Aspen Basic Engineering also supports the transmittal of basic design data to detailed design, providing an interface to Intergraph and AVEVA systems. Aspen Basic Engineering further manages process design information throughout the lifecycle of a facility. This enables engineering teams to share process and equipment information in a secure, access-controlled environment while debottlenecking the process. As an industry-leading process engineering solution, Aspen Basic Engineering improves the basic engineering function, enables rapid transition from concept engineering to basic engineering, and allows for the delivery of electronic data to detailed design and procurement. Significantly reduces elapsed time by up to 50%for the front-end design (FEL or FEED) process. Improves engineering efficiency by up to 30%1 and reduces probability of design inconsistencies by eliminating data transcription between engineering tools and disciplines. Takes advantage of an enterprise’s global engineering resources by providing a platform to seamlessly enable worldwide access to engineering tools while working from a single database across multiple locations and disciplines. Reuses best-practice design modules, saving re-design time for commonly used systems and units. Implements enterprise-wide and global design standardization of procedures and methods. Achieves best-possible cost and budget estimation early in the concept and basic design stages. Object-oriented data repository. Business object layer implemented on industry standardMicrosoft SQL Server and Oracle databases. Security and project integrity. Access and ability to create and change information based on project and facility roles. Comprehensive process datamodel. Stable CCDMdata model represents hundreds of man-years of process knowledge, including contributions fromearly-adopter user companies, covering a full range of process andmechanical design data objects for all equipment types. Conduct design work from block diagrams, PFD, P&ID,MSD, DPTD,Microsoft Excel, or datasheet view. Over 140 out-of-the box datasheet templates-including API, PIP, and NORSOK templates-covering five design disciplines. Create custom datasheets as needed. EmployMS Excel andMSWord as data input or display methods, includingMS Excel datasheets. Populate and maintain documents from a central data repository. Issue released documents in PDF, DWG, DXF, or DGN formats. Semi-automatic expansion from simulation to PFD and PFD to P&ID design phases, maintaining data integrity and design connectivity, but allowing individual company work processes to govern the activity. Load multiple cases of data from all major process simulators. Current integration is with Aspen Plus, Aspen HYSYS, PROVISION 8, Aspen CustomModeler. Transfer data to heat exchanger design programs (Aspen Shell & Tube Exchanger and Aspen Air Cooled Exchanger, Aspen Shell & TubeMechanical, HTRI XIST 5). Integrate with company-proprietary design tools and other third-party tools,achieving complete coverage of the basic engineering function. Transfer data to Aspen Capital Cost Estimator to perform (or re-baseline) cost estimates. Perform concurrent design work and merge modified data. Manage design cases or options separately. Proven scalability to perform reliably with thousands of users and projects, as well as complex unit and equipment configurations and connectivity. Support forWAN and Internet for global teams and external team members. Define access and security by project roles. Manage release and review of documents (e.g., datasheets, PFDs, lists) separately or in groups. Flexible to fit an organization-s existing engineering workflow. Hand off data for detailed design to Intergraph SmartPlant Suite through a point-and- click interface. Leverage ISO 15926 vendor-neutral interface. Save whole or partial designs and documents into a library of modular design templates and re-use in future projects. Provide design deliverables to detailed designer, constructor, or owner-operator while protecting process intellectual property. Configure to match company or project-specific standards. Capture engineering standards and best practices in built-in knowledge base. Seamlessly integrate third-party or in-house proprietary engineering applications through COM, .NET, XML, andMS Excel interfaces.